I sent out my survey to about 15 people and almost immediately, someone responded giving me the suggestion that I needed to add an opening question to clarify about whether or not the individual had a Facebook account. I tried to explain in my opening comments that if you didn’t have a Facebook account then you wouldn’t be able to complete the survey. Clearly this indicated to me that people just don’t read! There were several people who responded who didn’t have an account. I know of at least one who emailed me back and said that they didn’t have an account but took the survey anyway. So right off the bat I knew my results weren’t going to be very accurate. It was also suggested to add a question at the end for comments. By the time that I added this question, most of the people who I had sent the survey to had responded and only one person made any comments and bay the comment made, I know exactly who it was and therefore, really useable. I was please to use a logic question to separate out those who use Facebook with their students or parents and those who don’t. This process helped to minimize the number of questions that a survey might have to answer. I strongly believe that when creating a survey like this you really need some people to test it out for you before opening up the survey to a greater audience. No matter how you think it might work you will forgot something or it won’t work like you expected. This is when it really pays to have that personal learning network of people that you can recruit for testing purposes! I think my premise for the survey was pretty well defined. I wanted to find out how many teachers are using Facebook in their classes. If they were I wanted to know how they were setting them up and if they had to reprimand for bad behavior. If they weren’t using Facebook with their students or parents I wanted to know why now. I was also interested in knowing if teachers posted directly to Facebook or if they used other tools. I had 12 responses so clearly 9 people took the survey before this questions was added. The result for a couple of questions show that a few of the respondents didn’t actually have an account but attempted to take the survey anyway. I’ll point this out when appropriate. This question is one of the first logic questions and take people that don’t have an account to the submit survey button. This was interesting to me because I didn’t realize I had sent this survey to more than one k-6 teacher! These results were about what I expected based on who I sent the survey to. Again the results were about what I expected. This is the next logic question which will direct the survey to a separate branch of questions. 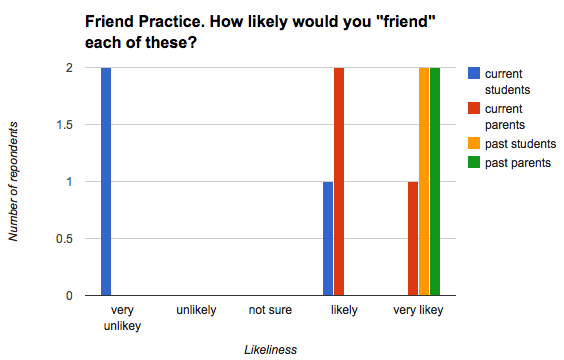 These results are from the section where teacher do not use facebook with students or parents. There were at least 7 respondents to this section. It stands to reason that if you don’t use facebook with students or parents then you don’t “friend” parents. This clearly isn’t a good question. Perhaps the logic question should have been restated to ask if teachers use facebook with students and didn’t include the parents reference or maybe it should just be eliminated. I do think there is a difference between communicating with students and communicating with parents so maybe this needs to be redefined. This tells me that schools do feel that there is a place for facebook as an institution. So of the 7 people who responded to this section, I had eight people respond….so something is a miss! I should have followed up the other with a text question to find out more information. Since no one in the previous section said they didn’t use facebook due to school or district policy the results for this section don’t make a lot of sense to me. Perhaps an open question asking what would be a good reason to use facebook in the class would be a better question. 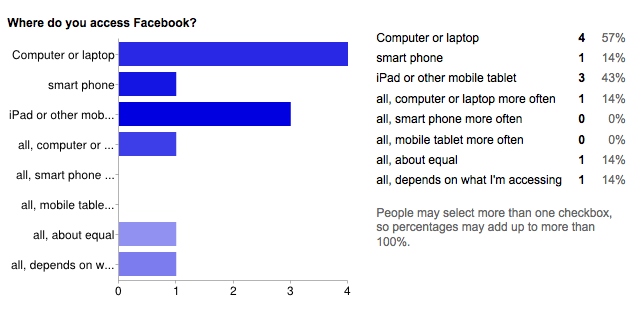 These results are from the section where teachers do use facebook with students or parents. There were only 3 respondents for this section. This was interesting to see how teacher were using facebook. It appease that they majority of teachers are using pages for special projects or events. This makes the most sense to me as a way to draw in users to share information. And it seems like the teacher who have chosen to use facebook have not had student (or parent) behavioral issues. This is encouraging as a positive use of facebook with students or parents. The results show that teachers are unlikely to “friend” past students or past parents. Once the students have moved on so have the teachers! It also shows that teachers are most likely to “friend” current parents rather than current students. This tells me that teachers are more apt to use facebook to engage parents in student’s activities. There final results are questions that both groups (those who used facebook with students/parents and those who didn’t use facebook with students/parents) who had a facebook account. The “Other” respondent said never so either they didn’t have a facebook account or had one created but never used it. Otherwise, most people seem to be actively posting. Again, the “Other” respondent said never so either they don’t read anything that anyone else posted or they don’t actually have an account. Most users seem to be active readers. When I posed this question I was curious to see how people are posting to facebook. I was curious of people are taking advantage of using facebook to tie together different applications like scoop.it or learnist, spotify, or other applications that can be tied to facebook.I was also interested in knowing if people were multi-tasking an using tools like IFTTT to script certain actions that they participate in to automatically post to facebook. Things like tweets, bookmarks in diigo or delicious or other social media tools. I was hoping that those who responded with 2 or greater would have indicated the tools but I didn’t get the results I was hoping for. For this last question I was curious about how people are accessing facebook. A comment that Ilana made that students don’t seem to be using smart phones or mobile devices in the library got me curious. Using facebook is certain a different process than exploring library databases but I was curious what tools teachers were using. I believe that using a google survey for short surveys with simple questions is a very good option. I’ve never had to collect more than a couple dozen responses from survey which is very manageable. I really like the summary results that are automatically created for you. This was the first time I used a logic question and was please that it worked out so well. I am unsure if using google survey for a massive survey would be the right tool to collect data. You would probably want to export the data and work it with microsoft excel for greater manipulation potential. I love your analysis of the survey! It really shows what you were trying to do, what worked and didn’t work, and what you learned. Ditto to Ilana. Very thorough analysis. You made it clear what you were looking for with your questions and your results–even given the small sample–seem reasonable. I use a similar assignment with my ED 329 class as an introduction to simple data collection, and I’ve found over the years that it’s best to mail the survey to yourself first, then to me, before sending it out to everyone in the class. It’s rare that you get it right the first time, and Google Docs is not particularly friendly about manipulating the spreadsheet once it’s done. So–all that by way of agreeing with you that it’s a good idea to test any survey with a smaller audience before final implementation. I’ve learned a lot from this iteration of the assignment. Because of the focus on K12 in this class, I’ve suggested using Google Forms as it’s a tool that most K-12 folks will have easy access to. I’ve also assumed that most students will have had little experience with the process of creating and administering a survey. That will all change the next time this class is offered. I’m going to suggest Google Forms for folks that are new to the process but also cite a few other options (e.g, Survey Monkey) for folks with more experience, a wider focus than K-12, and access to other tools. I’ll also make sure to let folks know that they have other options than focusing on K-12. I served on a Masters committee last year in which the candidate used Google Forms to survey all of the substitute teachers in FNSBSD. She received nearly 100 responses and GForms handled it reasonably well. She did move some of the results over to Excel on occasion to do some extra charting, but in her case she needed nothing more than simple sorting and a bit of filtering to report her results, and that worked well in GForms. Hi Heidi I have to say I like your survey. 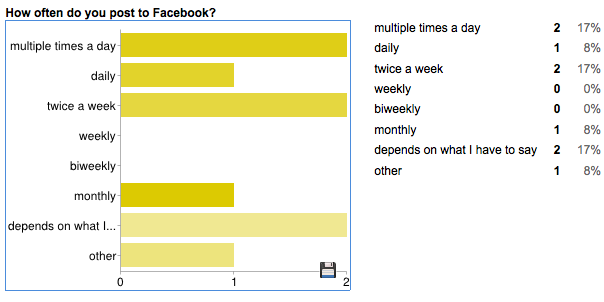 I am very interested in these results as I am thinking about using FB for a class page. I did notice one mistake you stated that most teachers are unlikely to friend past students or past parents. What I see is that they will friend past students not current students. I looked closely at that because I make it a policy not to friend current students, but when they graduate I will accept them as friends to keep in touch with them. I like to keep in touch with past students and to celebrate their successes and be there for support if they need it. I have had students tell me they look forward to friending me when they graduate and most of them do send me a request soon after graduation. Good job on the survey I will be looking more at your results and will be interested if you take this further in the future. I have been asking parents if they would be join a class page and most have been very positive. I even sent my survey to some parents to see how they would answer my question on FB on my survey, results will be up soon.